Baby pandas may be more like humans than we thought! A photographer at a zoo in China just wanted to take a few shots of the pandas, but this cub just wants to have some fun. 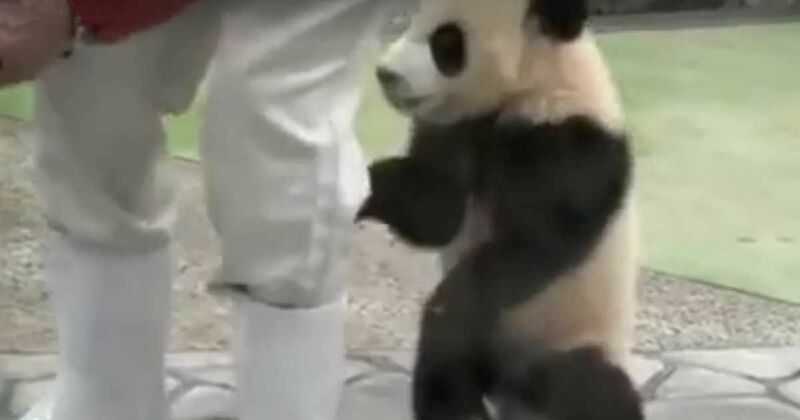 Watch the video below, from Red FM, as the panda wraps its paws around the photographer's ankles and toddles after him as the photographer tries to focus on doing his job. While the video is unclear about where this panda is located, it is clear that the cub just wants a little playtime and will not easily be deterred. If you think this panda is adorable, you're not alone; in fact, there is scientific evidence to suggest that the big eyes, wobbly head, and button nose stimulate the pleasure section of your brain, according to NPR. An article in the Washington Post suggests that "baby schema," an emotional trigger that encourages nurturing and survival, may be to blame. This evolutionary emotional response helped early humans and animals continue to thrive in the wild. Whether it's science or emotion, the video of this playful panda has been viewed more than 21 million times! We all need a Panda in our life.